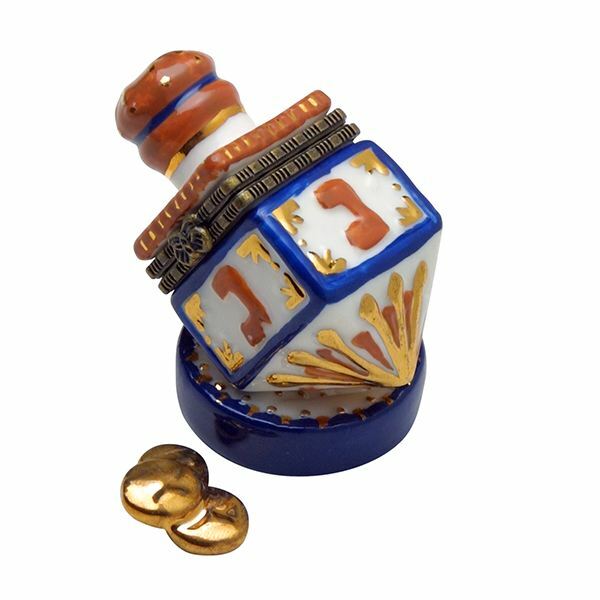 The only truly traditional Hanukkah game is the game of dreidel – which can be over the heads of most preschoolers. Try some of these Hanukkah games for kids in preschool instead, including a preschool variation of the dreidel game. Before you begin teaching your kids the rules of the dreidel game, it’s important to explain the background of the game. Tell the kids that a long time ago, the Greeks tried to stop Jewish children from learning about being Jewish. They threatened them, and told them that they weren’t allowed to learn the Torah anymore. But the Jewish children were brave. Their teachers took them into hidden caves to learn Torah with them and teach them about being Jewish. If the Greeks would come and find them, the kids would immediately take out their little spinning dreidels and begin to play a game. In that way, the Greeks would think that the kids were just playing a game in the cave instead of learning about being Jewish. That’s how the kids were saved! Gimel – Take two coins from the other player. Heh – Take one coin from the other player. Shin – Give two coins to the other player. Have each player start with ten coins, and take turns spinning the dreidel and responding accordingly. This game is more fast-paced than the original version, although the rules mirror the original rules. If you have a large group of preschoolers, try playing pin the candle on the shamash with them. Draw a menorah with all eight candles but the shamash missing. Then blindfold one child and hand her a candle to pin on the missing shamash. Continue with the normal rules of “Pin the Tail on the Donkey." Hanukkah gelt are small foil-covered chocolate coins that can be purchased at many stores around Hanukkah time. Hide ten pieces of Hanukkah gelt around a room and challenge your preschoolers to find all of them. When they find all of them, have a Hanukkah gelt party and let them eat them all! These Hanukkah games for kids in preschool will keep your little ones busy for quite a while. Best of all, the games can help teach them about the holiday, too!